Improve Incident Management with Technology. 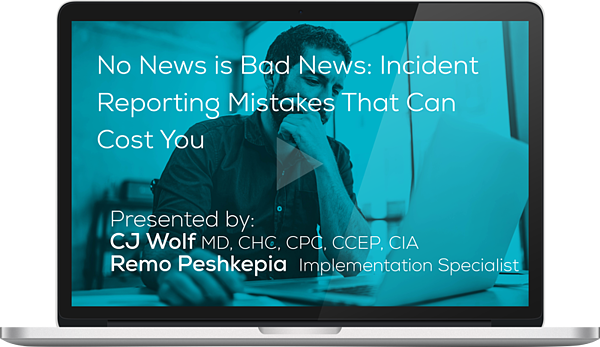 As a compliance professional, you might find yourself celebrating how few incidents are reported at your organization. Many compliance professionals are under the impression that if no incidents are reported, no compliance violations have happened. But this isn’t true. In fact, what it probably indicates is that bad things are happening but they’re just going unnoticed or undocumented for whatever reason. To maintain an effective compliance program, you want your employees to report incidents because it might be your only chance to correct issues that might otherwise never be brought to your attention. According to the OIG, an effective compliance program should increase “the likelihood of preventing, identifying, and correcting unlawful and unethical behavior at an early stage.” It should also encourage employees “to report potential problems to allow for appropriate internal inquiry and corrective action.” This is what we compliance professionals call incident management. Improving your processes can make it easier to train employees on the importance of reporting, simplify the way your employees report incidents, and advance how you investigate and document incidents. Learn how software can streamline your incident management processes so you can discover and resolve serious problems before it’s too late.